Looking for a way to help out the special needs community and get a great meal? Look no further. Join Red Robin and your local law enforcement for their Tip-a-Cop fundraiser. On October 16, Special Olympics Orange County will partner with Red Robin for the annual Red Robin Tip-A-Cop. 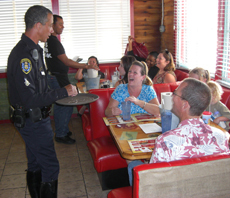 Law enforcement officers will wait tables, collect tips and help raise money for Special Olympics! Dine out from 5 – 9 p.m. on October 16 at Red Robin restaurants in Orange, Brea, La Habra, Irvine, Garden Grove, Cypress, Foothill Ranch, Santa Ana or Tustin. Don’t miss out on the excitement! For more information and participating locations, visit the Red Robin Tip-A-Cop website. If you’re in Long Beach, there are locations for you as well.